VILLAS AND APARTMENTS TO RENT ON THE COSTA DEL SOL SPAIN. 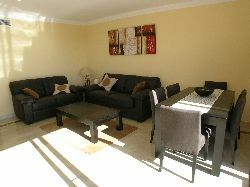 Welcome to our selection of holiday homes to rent on the Costa del Sol in Spain. The Costa del Sol is one of the most famous European holiday destinations with it's temperate climate, miles of sandy beaches and spectacular countryside. The main airport serving the area is Malaga but the airport at Gibraltar is also popular for the holidaymaker staying on the Western end on the Costa del Sol. The Costa del Sol is a golfers paradise with over 60 courses along it's length some of which such as Valderrama are amongst the most famous in the World. The Costa del Sol is now a year round destination enjoying around 300 days of sunshine a year. Looking for self catering holiday accommodation on the Costa del Sol, then below is a selection of Costa del Sol apartments and villas that can be rented direct from their owners. You can either click on each listing for further details or you can use our search engine on the left if you are looking for something in particular.